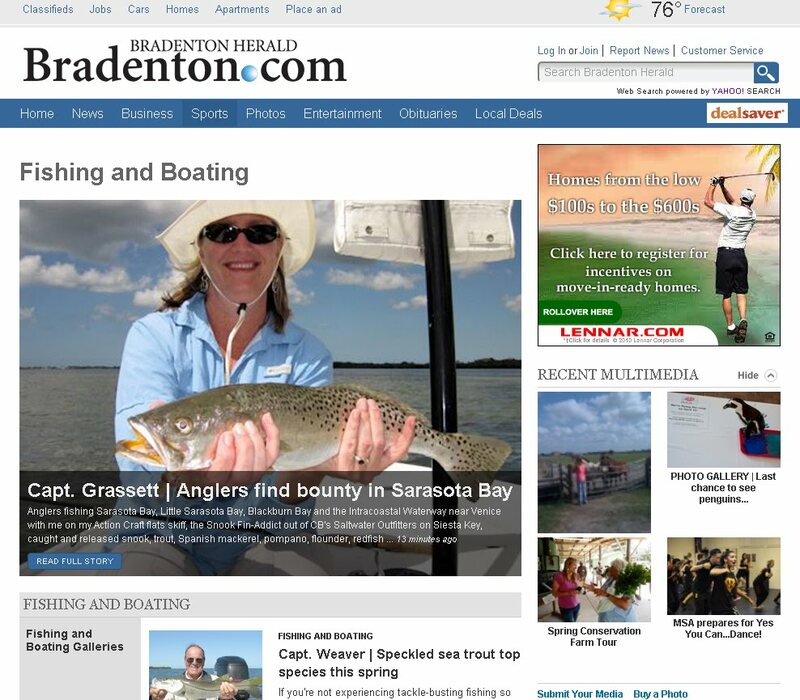 The first photo contribution to our Fishing & Boating section from an online reader almost didn't make it to Bradenton.com. VMix, the tool used on our site to submit photos, has a screening mechanism to flag objectionable items. This one was headlined, "How to make the boys jealous!!" But VMix blocked it, stating "everyone must be fully clothed." After screening it, however, the editors decided the fisherwomen were in acceptable Florida boating attire. It's good to know there's a safety net on submissions, though. 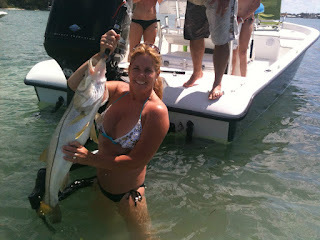 And it's great to know there's 37-inch snook off Jewfish Key! Looking for the best place to catch speckled sea trout? What's biting with the lower tides this week in Terra Ceia Bay? What were the prize fish pulled in from Sarasota Bay? Capt. Weaver, Capt. Markham and Capt. Grassett are here to tell you, on our new online Fishing & Boating site -- bookmark this link! For years we've published the Hot Spots Fishing Report in the Bradenton Herald, found today on Page 5C in the Sports section. We plan to keep providing that, along with Jon Chapman's Sunday outdoors column. But we now want to get as many local captains, fishermen, fisherwomen and fisherkids to send their tips, brags and photos to Bradenton.com. 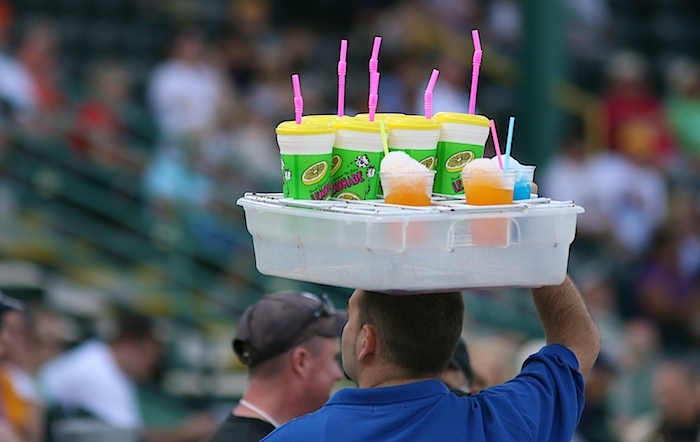 For now, send your entries to Sports@Bradenton.com and we'll post them for you. Good morning, it's Sunday, March 18. It's a glorious weekend in Florida -- a veiled excuse of why I'm belatedly weighing in on one of my favorite fund-raisers, the 25th annual Library Foundation Book & Author Luncheon. This event is not that different from most fund-raising luncheons in Manatee County. They're typically held either at the Bradenton Convention Center or the Polo Grill in Lakewood Ranch (this one was the latter), with 8- or 10-top tables filling the room with a guest speaker at the helm. But I love this luncheon for one huge reason: It's for the love of writing, the love of books. All kinds of books. 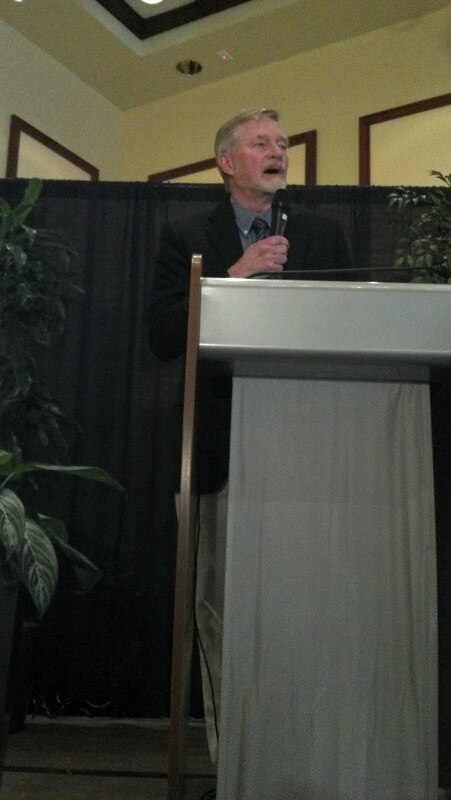 This year's keynote was Erik Larson, profiled last week in this feature by Wade Tatangelo. Larson talked Friday about the DNA of a story, of how the germ of that story comes from a "dark country of no ideas" -- a writer's worst enemy, that blank page. And how his books sink readers into the past, allowing them to emerge with a true sense of traveling into that history. I came away with his autographed latest, "In the Garden of Beasts," vowing to find the time. The time to read. What a wonderful problem to have. 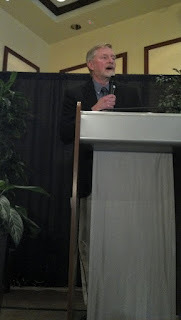 And, unlike my Missouri Tigers on Friday, I won a raffle for a basket of books, Thrillers and Chillers, at the luncheon! The half-dozen gems include Jeffery Deaver's "007 Carte Blanche" -- lucky for me that meant martini glasses, a silver cocktail shaker and a few other basket toppers. I plan to start devouring these novels, then donate the slightly used copies to the downtown Bradenton library. I'll have to think about those martini glasses -- shaken or stirred? Sign up for our sports e-newsletter, and register for a chance to win four tickets to McKechnie Field on March 26. The Pittsburgh Pirates will be squaring off against the Baltimore Orioles. You can enter if you already have signed up, too. Just click here and either log in or register for the daily sports blast. I get all of ours, of course, including local news, the business report, food and wine, entertainment -- and news of the weird. Each of them provides a great menu of stories to click on. Hope to see you at the ballgame! We needed a copy editor with a lot more country twang in 'em this week. Heck, even a homegrown Nashville native might not have saved us on this one. Features Editor Jana Morreale has been working all hours to redesign Weekend, our weekly entertainment section published every Thursday. The old design, with that round "W", was tired. Jana's goal: to design something bolder, more straightforward, clean. And she pulled it off, no help needed. So we were ready to celebrate Thursday morning as the new magazine hit the stands. That's when the phones started to ring, and commenters hit the cover story on Bradenton.com. That fabulous new cover boasted quite a handsome country singer -- just not the singer features writer Wade Tatangelo had featured. OMG I am so sorry I have no idea how this happened. I was clearly working entirely too fast. 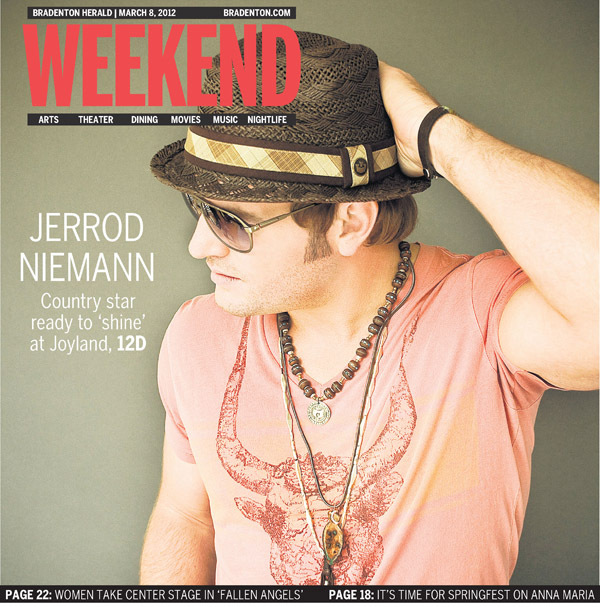 The “singerSonJerrod” photo is Jerrod – the other two are our client, Eric Church. Please accept my sincere regrets. Correct photos of Jerrod are attached… I will accept total responsibility. The new magic? We were able to send a corrected cover to our e-edition, and get the right photos attached to Wade's feature online. "The temperature in New York: 49 degrees." "The temperature in Pittsburgh: 42 degrees." "The temperature here at McKechnie Field? 79 degrees!" 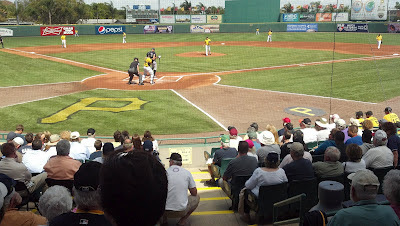 What a glorious day for baseball in Bradenton, and my first game of the season. Business Editor Jennifer Rich (devout Red Sox fan) went with me (maniacal Cards fan) for a few innings of Pirates vs. Yankees. We got there just in time to hear Manatee High's women's ensemble sing the national anthem. If you haven't heard them yet, check out Vin Mannix's preview story and Paul Videla's video capturing their harmonious rendition. Both teams started with their stars, adding even more electricity to the sold-out crowd. Here's the view from my new seats this year -- totally awesome. And yes, it was a working ballgame hour for us -- honest. But we managed to wolf down a couple ball dogs and enjoy a few innings before heading back to the newsroom. And we had John Lembo's blog to keep us posted. Despite the team names, both squads are wearing gold jerseys. Their pants tell them apart - Team Gold is in grey, Team Black is wearing white. And for those of you stranded in stormy clime up north, temps in sunny Bradenton are in the mid-80s, skies are blue, and the breeze of baseball is in the air. We send along a glimpse through two of Herald photographer Paul Videla's images from this afternoon.